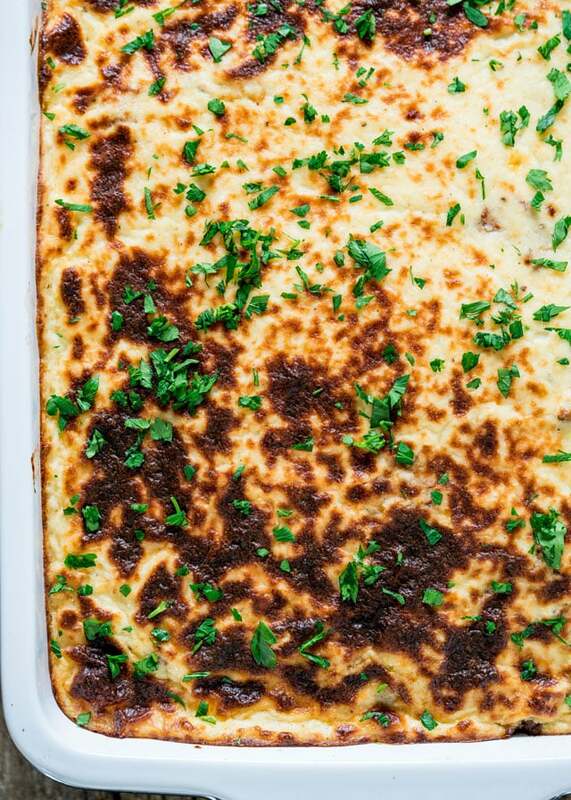 This Greek Moussaka Recipe is packed with layers and layers of eggplant, zucchini, potatoes, meat, and a creamy bechamel sauce. 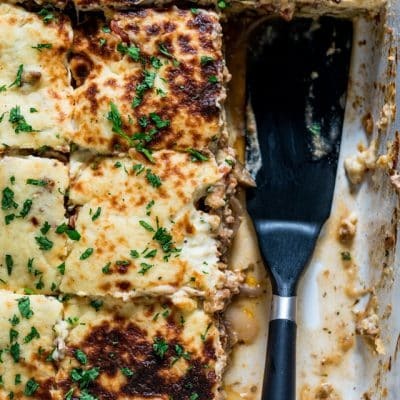 This Moussaka is so hearty and will surely tickle your tastebuds. I’m so excited to share this recipe with you because this recipe truly is a treat. Usually I try and give you easy and quick recipes that you can make for dinner, but sometimes I want to give you recipes which are dear to my heart and are worth every effort you put into them. This may be a labor of love, but trust me when I tell you it is so worth it. I used to make moussaka years ago because I would always have tons of leftovers which would last us the entire week. Now these are the kind of leftovers I can’t wait to dig into, because this moussaka is even better the day after. After all these years of making this recipe, I can confidently say I’ve formulated the perfect moussaka. 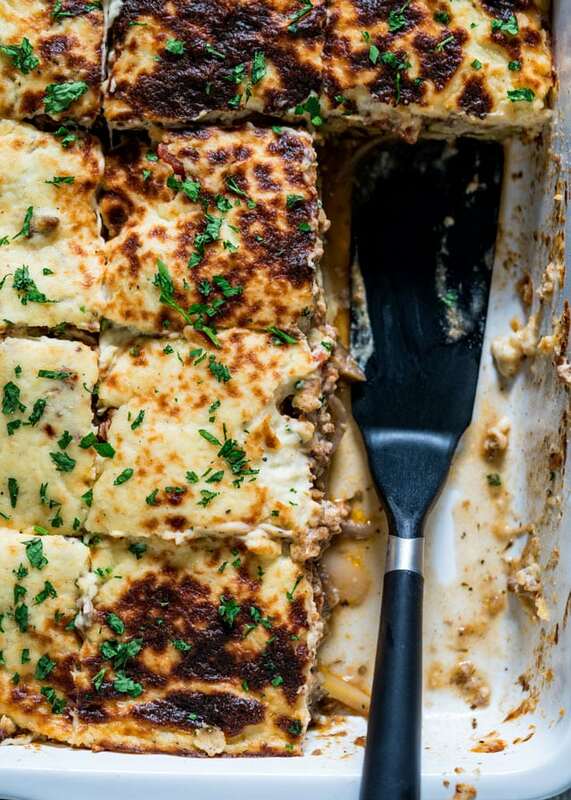 For those who aren’t familiar with moussaka, it’s basically like a Greek lasagna, except it’s layered with lots of vegetables rather than noodles. You also have a delicious spiced meat layer and a creamy bechamel sauce. It really is the comfort food of Mediterranean cuisine! If you love Mediterranean food then this moussaka is a must. Don’t worry- this dish is not complicated in the slightest. It is time consuming, but actually very easy to make. I love these types of dishes, they’re the kind of dishes that I grew up with! There is just something so therapeutic about spending a couple hours in the kitchen cooking and coming up with a moussaka that’s so comforting and seriously satisfying. What Ingredients Do You Need for Moussaka? All these ingredients are super typical and you probably already have most of them hanging out in your kitchen! You can also use any type of ground beef that you like best. Lamb, pork, chicken, turkey, you name it! Keep in mind that if you use a fattier type of meat, you’ll need to drain the pan after you’ve browned it. *Allspice is a dried berry that is used as a spice. It smells like a combination of cloves, cinnamon, nutmeg, juniper berries, and pepper. It really amps up the flavor in this recipe! You can find allspice in the spices aisle in your local grocery store. Preheat your oven to 400 F. Slice the potatoes, eggplant, and zucchini to 1/4″ slices. Make the potato layer: Toss the potatoes with red onion, olive oil, salt, pepper, thyme, and oregano. Spread the slices in a single layer in a 9×13 baking pan. Bake for 20 minutes until the potatoes begin to soften and brown slightly. Make the eggplant layer: While the potatoes are baking, sweat the eggplant by sprinkling salt on both sides of each slice and letting them sit on paper towel for 10 minutes per side. Blot the slices with an extra piece of paper towel to grab any excess water. Spread the eggplant slices in a single layer over the potatoes. Drizzle with olive oil, then sprinkle the salt, pepper, thyme, and oregano over the slices. Bake for another 20 minutes. Make the zucchini layer: Once the eggplant layer has finished baking, spread the zucchini slices in a single layer over the eggplant. Drizzle with olive oil, then sprinkle the salt, pepper, thyme, and oregano over the slices. Bake for another 20 minutes. Prepare the meat: While the veggies finish cooking, you can make the meat sauce. Heat the olive oil in a skillet over medium high heat. Add the onion and cook until it softens and becomes translucent. Add the garlic and cook for 30 seconds. Now you can add the meat and break it up until the meat has browned and no longer pink. Season with salt and pepper, then add the allspice, Italian seasoning, and tomato paste. Give everything a good stir. Pour in the chopped tomatoes and continue to stir until most of the liquid cooks off. Remove it from the heat and set aside. Make the bechamel sauce: Melt the butter in a skillet over medium heat. Whisk in the flour until smooth and let it cook for about one minute, continuing to stir. Pour the milk in slowly, while whisking, to create a nice creamy consistency. Let the sauce bubble and add the salt, pepper, and nutmeg. Add the egg yolks and whisk well so that they become well incorporated. Stir in the cheese, bring the sauce to a boil, then remove it from the heat. Add 1/4 of your bechamel sauce to the meat mixture and mix until well incorporated. Finish the moussaka: Spread the meat mixture evenly over the zucchini, then pour the bechamel sauce over the meat mixture. Use a spatula or spoon to smooth out the bechamel. Bake for a final 30 minutes until the top turns golden and browns. Allow your moussaka to cool for 1 hour before serving. Do I Need to Peel the Veggies? I personally like my potatoes peeled, but you can leave the skin on if you don’t mind it. For the eggplant and zucchini, you do not need to peel them. Their skins become super soft in the oven and you won’t notice a difference in texture at all versus if they were peeled. What Kind of Baking Dish Should I Use? Make sure you get a nice and deep casserole dish so that all these layers will have room to bubble and bake without spilling over the edge. I used a 9×13″ casserole dish. You can also use 2 9×9″ square baking dishes. Transfer the moussaka to an airtight container, or wrap it well with plastic wrap. It will last 3-4 days in the fridge. You can also store moussaka in the freezer. I find it’s easiest to transfer the moussaka to individually sized containers, but you can freeze the entire casserole as well as long as it’s well sealed. It will last 3-4 months in your freezer. Reheat either in the microwave, or covered with foil in the oven at 400 F for 1 hour or until heated through. Craving More Greek Food? Try These Recipes! 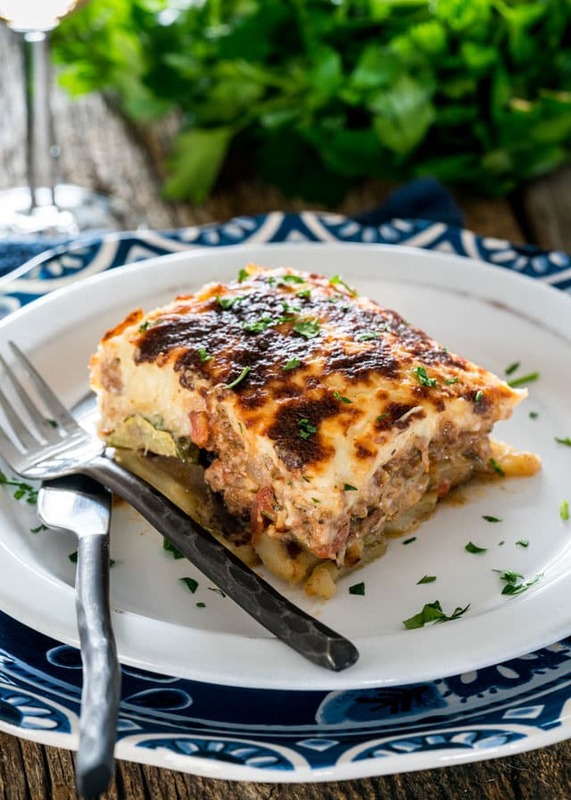 This Greek Moussaka is packed with layers and layers of eggplant, zucchini, potatoes, meat and, of course, a creamy bechamel sauce. This Moussaka is mouthwatering and hearty and will surely tickle your tastebuds. Start by tossing the sliced potatoes and red onion with the olive oil, salt, pepper, thyme and oregano in a medium size bowl. Spread them in a single layer on the bottom of a 9x13 inch baking pan. Bake for 20 minutes until they begin to soften and turn golden. While the potatoes are baking, sweat the eggplant slices by placing on paper towels then sprinkling some salt over each slice. Let them sit like that for about 10 minutes then flip them over and sprinkle with additional salt. After 10 minutes you can soak up any water you may see over the eggplant with paper towels. Spread the eggplant slices over the potatoes in a single layer. Drizzle with the olive oil, season with salt, pepper, then sprinkle with the thyme and oregano. Place the pan back in the oven and bake for another 20 minutes. Once again spread the zucchini slices over the eggplant layer in a single layer, then repeat by drizzling olive oil, seasoning with salt, pepper and sprinkle with the thyme and oregano. In the meantime, prepare the meat. Heat the olive oil in a large skillet over medium high heat. Add the onion and saute until it softens, for about 3 minutes. Add the garlic and cook for about 30 seconds, just until the garlic becomes aromatic. Add the ground meat and using a wooden spoon break it up into small pieces. Cook until it's no longer pink, about 5 minutes. Season with salt and pepper. Add the allspice, Italian seasoning, tomato paste and stir well. Stir in the chopped tomatoes and cook for another 5 minutes, stirring occasionally, until most of the liquid evaporates. Set aside. To make the bechamel sauce, melt the butter in a saucepan over medium heat. As soon as the butter has melted whisk in the flour until it gets fully incorporated into the butter. Start to add the milk slowly. I usually add it in about 4 batches, so add 1/4 of the milk at a time, whisk until all the liquid is absorbed by the flour and repeat until you have whisked in all the milk. When the sauce start to bubble, it will be ready to whisk in the pepper and nutmeg. Add the egg yolks to the sauce and whisk them in well. Stir in the Parmesan cheese, bring the sauce to a boil again and remove from heat. Add about 1/4 of this sauce to the meat mixture and stir. Spread the meat filling over the vegetable layers, then pour the bechamel sauce over the meat and smooth it out with a spatula or spoon. Bake for another 30 minutes or until the top is golden brown. Remove from the oven and allow it to cool at least 1 hour before cutting it into pieces. Garnish with parsley if preferred before serving. Store leftovers in an airtight container in the refrigerator for up to 3 or 4 days. This recipe can be made a day or two ahead of time and reheated in the oven at 350 F for 10-15 minutes. 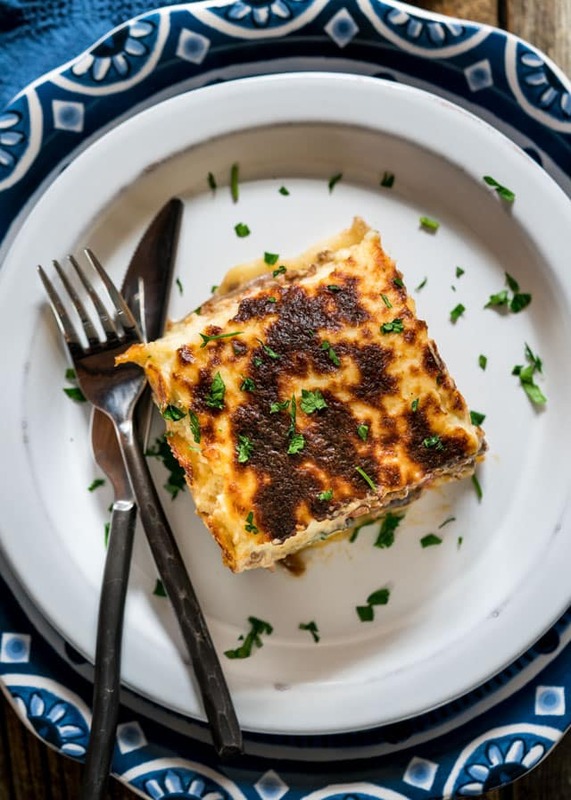 You can serve this moussaka with a side of Greek style salad. Also some veggies would work as well such as Greek style green beans. Look forward everyday to see what recipe you send me in my email. I am looking forward to trying this Moussaka recipe but wanted to know what type of potato do you suggest. I would suggest Yukon Gold 🙂 Russets are also a great all-purpose variety, but a little starchier than Golds. I made this the last time you posted it and it was divine. I had guests over and everyone raved about it. It was melt in your mouth delicious. This is definitely a keeper. So good! I’ve made lots of moussaka but never one with a bechamel layer. I used a huge roasting pan, 9×13 and probably 4 or 5 inches tall (much deeper than a standard 9×13 pan) and it was perfect. Instead of meat, I used about 1 C of dry black lentils and twice the amount of canned tomatoes. I think the spices could be turned up a bit in terms of allspice and nutmeg – those warm flavors compliment the dish so well but were a little muted with the recipe amount given. I was almost out of AP flour, so I used chickpea flour (aka gram flour; gluten-free option) and it still thickened my sauce perfectly! I let cool for about 45 minutes and it was fine to cut, hold together, and be warm to eat. Wow this was so good! I made this dish for New Year’s Day dinner yesterday, 1/1/19. It came out awesome, but my Pyrex 9″ x 13″ is a bit too shallow for all of the ingredients without bubbling over. So I made a second side pan in a smaller square dish. Before I make it again I plan to get a deeper lasagna dish. Beyond that it came out perfect! I’ll make it again and again. Joanna, what a lovely recipe! I would love to make it but have never made Bechamel with GF flour. Do you think rice flour or all purpose GF flour will work? I’m not an expert when it comes to GF flour, since I hardly don’t ever cook with it. The purpose of the flour is to thicken then bechamel sauce, and I’m not sure if GF flour is good for that.